Figure 2.11: Entrance to the "stro-nomical room" of the Denderah Temple. Figure 2.12: The Denderah Temple. in these horoscopes prevailed among historians and all the other attempts to date these horoscopes were abandoned. 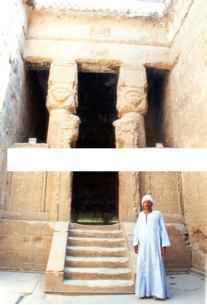 A recent picture showing the entrance to the "astronomical room" in the famous Denderah temple is shown on Figure 2.11, and a photograph of the full view of the Denderah temple is shown on Figure 2.12. Another example of an Egyptian zodiac, which was painted on the interior of the cover of a wooden sarcophagus, is presented on Figure 2.13. It was discovered during one of his expeditions to Egypt, by famous 19th century German Egyptologist Henry Brugsch. The picture shown on Figure 2.13 comes form his published work . 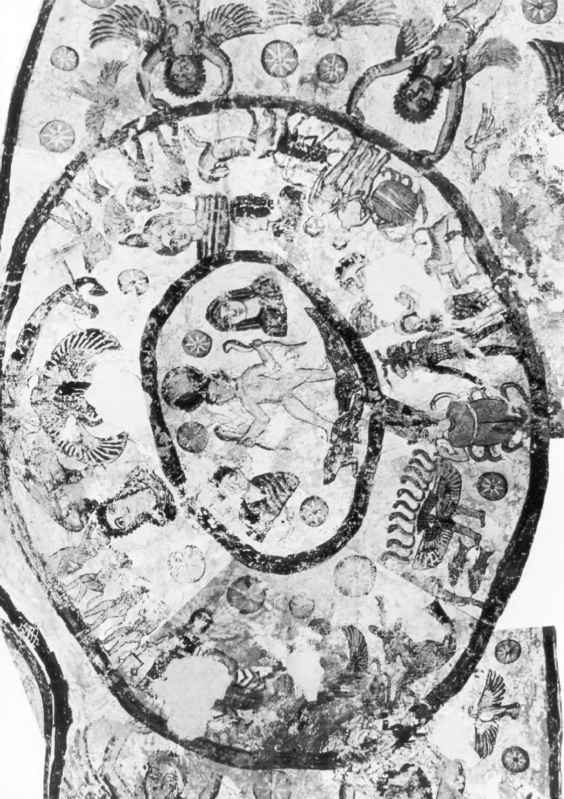 On this zodiac, the figure of the "Goddess Nut" is in the center of the picture and the zodiac constellations, which are again very easy to identify, are painted on her both sides. On the left, under her arm, we see the symbols of Cancer, Leo, Virgo, Libra, Scorpio and Sagittarius, and symmetrically on the right, are placed the symbols of Capricorn (with head painted in black), Aquarius, Pisces, Aries, Taurus (painted black) and Gemini. The order of these constellations is correct, exactly like it appears on the real sky. Brugsch noticed some ancient Demotic writings near the constellation symbols on the left. He translated all of them and found out that they were the names of planets, so a complete horoscope could be identified. As on this horoscope all the planets are marked by annotations, which appear clearly to be made later, we will call it Annotated Horoscope. Careful study of this zodiac (see section 8.2) will show that it contains other original horoscopes, which were not noticed by either Brugsch or Morozov. ready published in 1862, Horoscope was 1861. Our next example of an Egyptian zodiac is taken from the Napoleonic Album. This zodiac was found in a huge temple during the Napoleonic expedition, in the ancient city of Esna located on a bank of the river Nile not far from Denderah. 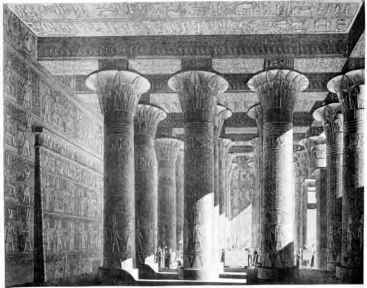 A drawing of the main hall in the Esna temple, which was made by Napoleonic artists, is presented on Figure 2.14. On this pic ture one can clearly distinguish this zodiac on front part of the ceiling. 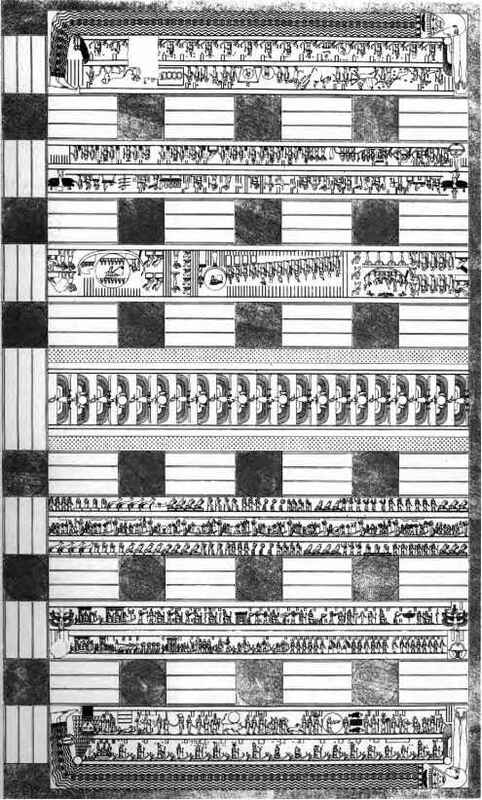 The detailed drawing (made by Napoleonic artists) of the Esna temple's main hall is shown on Figure 2.16. Again, the zodiac constellations are clearly indicated and can be easily recognized. 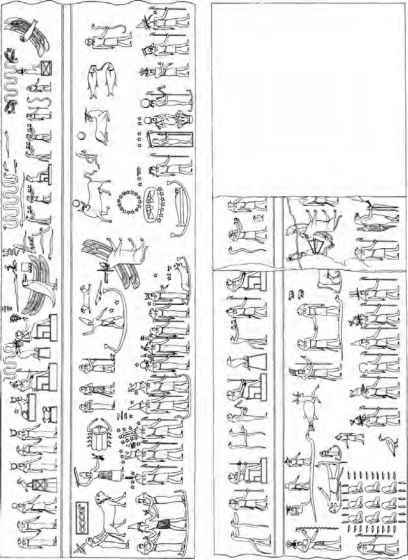 Not surprisingly, the Big Esna zodiac also contains a horoscope as well as some additional astronomical information, which can be interpreted and used to find the precise date depicted on it. 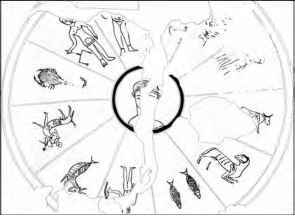 Later, we will discuss in detail all the symbols on the Big Esna zodiac, but right now, we would like to indicate that their meaning appear to be purely astronomical. Of course, at the first glance one can have an impression that there could be a mystical denotation behind this picture. Actually, it is a common belief among Egyptologists that Egyptian zodiacs have mostly religious meaning inspired by astronomical phenomena. We will argue that this claim is not true. (see Figure 2.15). 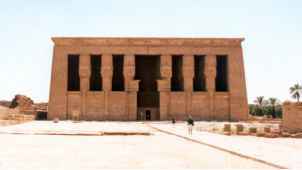 The size of this temple was much smaller and it was badly damaged. Fortunately the condition of the zodiac was rather good except for a missing part around the constellations of Scorpio and Virgo. 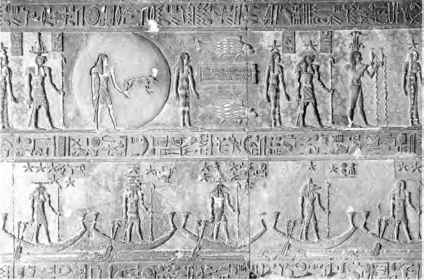 In order to avoid misunderstandings related to the fact that there are two Esna zodiacs, we will call the second one the Small Esna zodiac, but this name has nothing to do with its real size. On Figure 2.20, we present a drawing of two zodiacs, which were discovered in 1901 in the city of Athribis in Upper Egypt near Sohag, by the well-known Egyptologist W. Flinders Petrie. The zodiacs were located on a ceiling of an ancient Egyptian burial cave and probably indicated the dates related to this interment. These Athribis zodiacs were analyzed for the purpose of astronomical dating by the renown English astronomer A.B. Khnobel, and later by M.A. Vil'ev and N.A. Morozov (see , Vol. 6, p. 728-752). However, their decodings of the zodiacs appear to be wrong, which we will prove later. We will also explain the probable reasons of their misinterpretations of the symbols on zodiacs, that led them to the wrong dates. 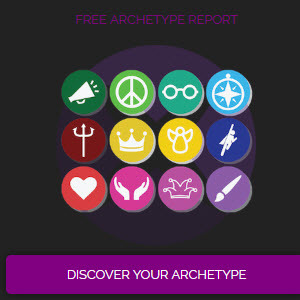 Our computations show that there exists an excellent solution for this pair of zodiacs, which perfectly agree with all the symbols, so a unique and definite dating can be achieved. The intriguing features of the Small zodiac will be discussed later in this book (see section 7.5), but we can reveal now that its symbols also express the real astronomical events and their unique purpose was to record a certain date. A view of the Small Zodiac is presented on Figure 2.18 and Figure 2.17. Up to the recent times, the computations related to the dating of the Athribis zodiacs were practically beyond human capacity. Only with the use of computers it is possible to carry on the calculations for all possible variants of decodings. The previous researchers, who worked during the first half of the twentieth century, were forced to introduce additional assumptions in order to reduce the amount of computations (which were done by hand). Nowadays, we realize that these additional restrictions were incorrect and consequently the solutions obtained by Khnobel and Morozov were wrong. 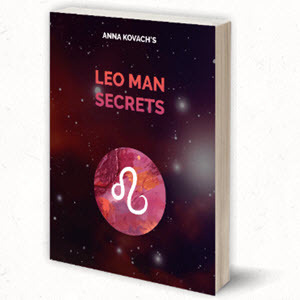 The reader will find an extended discussion of the symbols of the Athribis zodiacs and their correct dating in the subsequent chapters (see chapter 5 and section 8.1). 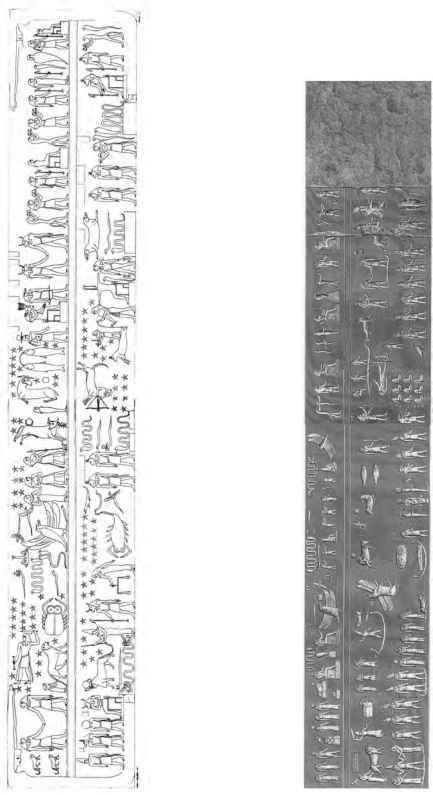 Two more examples of Egyptian zodiacs are presented on Figures 2.21 and 2.22. 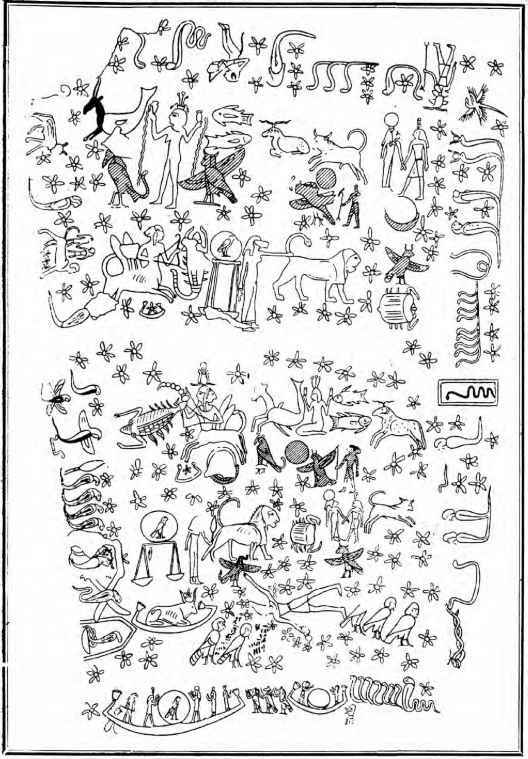 Notice that the constellations are shown there using typical symbols, similar to those on the other Egyptian zodiacs. However, the planets are symbolized by bust portraits (what is quite unusual for Egyptian zodiacs in general). These zodiacs were discovered in the middle of the 20th century in a supposedly ancient Egyptian sepulchre of Petosiris. They were painted on the ceilings of the inner and outer rooms of the tomb. 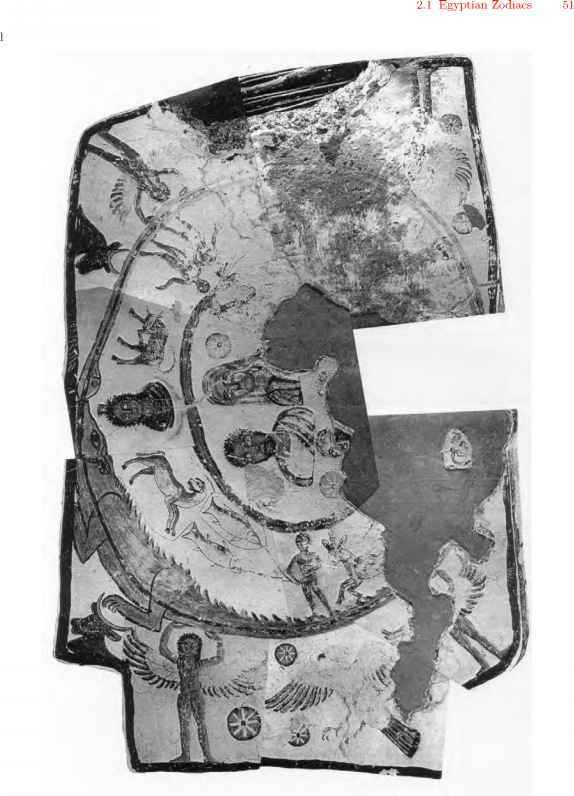 The dimensions of the whole picture with the zodiac located in the inner room are 2.12 m x2.62 m.
Both of the Petosiris zodiacs were studied in the paper by O. Neugebauer, R.A. Parker and D. Pingree, in which the authors do not even make any attempt to understand the data as an astronomical record, but assume that the only meaning of these zodiacs is related to Mithraism — an ancient religion. They indicate that the symbols of the zodiacs represent natural forces, physical desire, rationality, intelligence and other metaphysical concepts. The positions of the planets, according to these authors, are determined by some symbolic meaning of planets and constellations in Mithraism without any connection to astronomy. We will dispute this point of view and argue that there is a precise astronomical meaning in both zodiacs. Each of them indicates a certain date. The complete analysis of the astronomical data contained in these zodiacs and their dating will be presented later in this book. Let us point out that not all Egyptian zodiacs contain a horoscope. Some of them just show the zodiac constellations without any planet. Of course, the precise astronomical dating of such zodiacs makes no sense, since there is no sufficient data available. 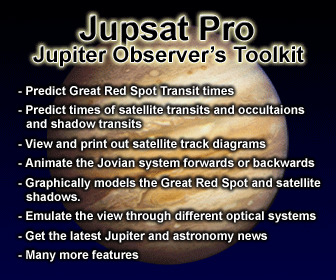 However, in this situation an approximate zodiac's age can be estimated by comparing this zodiac with other similar zodiacs for which precise astronomical dating can be done. As an example we present in Figure 2.19 a picture of such a zodiac without horoscope. 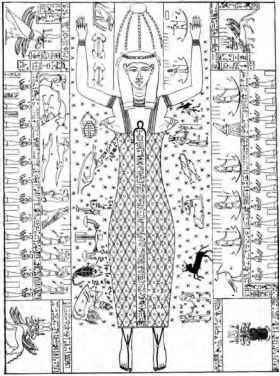 There are also some examples of old Egyptian zodiac showing less than twelve zodiacs constellations, some of which are symbolized by unusual figures. For example, on some old Egyptian zodiacs there was a figure of Raven among the zodiac constellations, what may indicate that different type of division of the ecliptic into zodiac constellations was used in earlier times. Notice, that there is a constellation called Raven neighboring the zodiac Virgo constellation. One of such untypical zodiacs is illustrated on Figure 2.23. 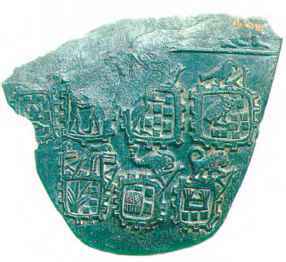 This old Egyptian zodiac, which was made of schist, is called "Libyan Palette." There is a little doubt that this palette indeed represents a zodiac in spite of its untypical appearance. All the constellations are shown as towns surrounded by walls with constellation symbols placed above them. For instance, one can easily distinguish there Leo and Scorpio. 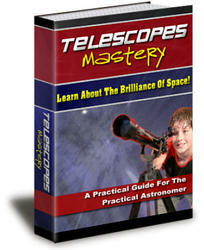 Notice, that each of the constellation symbols is holding an astronomical instrument resembling a primitive sextant. 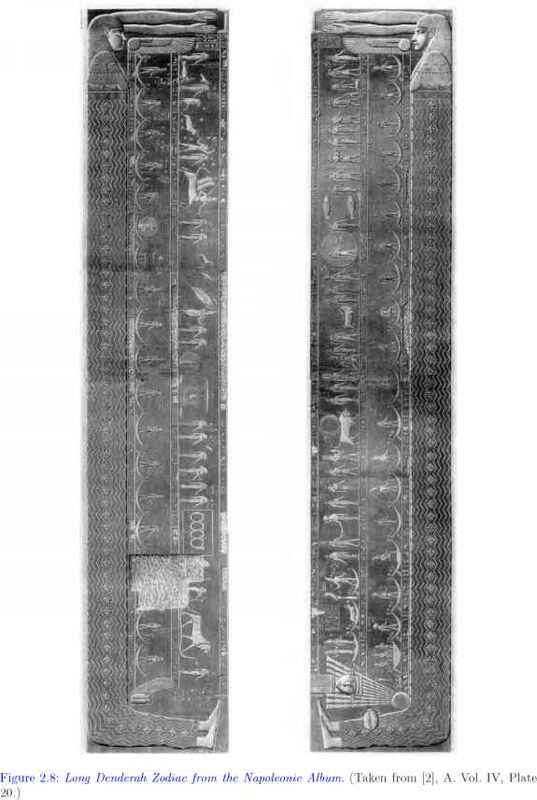 A very similar instrument is placed in the right hand of Ptolemy on an old drawing shown on Figure 2.24. As we already mentioned, these older zodiacs could be made at the time when the division of the ecliptic into zodiac constellations was not yet in its final stage, with less than twelve constellations distinguished on the zodiac belt.